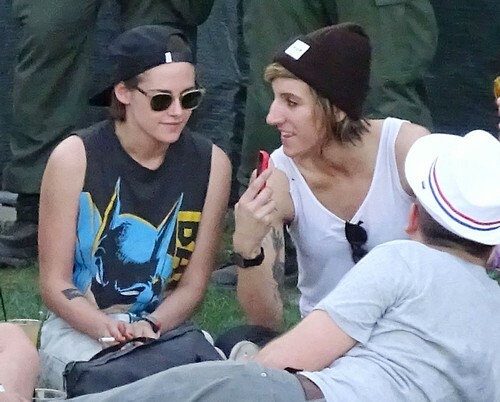 Kristen Stewart and Alicia Cargile PDA At Coachella: Twilight Actress, Former Assistant Plan Low Key Wedding? Kristen Stewart and her long-time girlfriend Alicia Cargile were spotted at Coachella and are rumored to be engaged and planning a low-key wedding. The couple stepped out on April 19 together and attended the second weekend of The Coachella Valley Music And Arts Festival in Indio, California. Kristen Stewart and her fiancé Alicia could not keep their hands off each other at the festival, and were photographed cuddling on the ground while they were enjoying the music with their legs draped over each other, and even holding hands. In one photo Kristen even reached out and touched Alicia Cargile’s breasts. Ironically, Kristen Stewart and Alicia Cargile’s photos mirror the infamous ones that were snapped of K-Stew and her ex Twlight boyfriend Robert Pattinson. Anyone who is familiar with Kristen and Robert’s relationship and their trips to Coachella can tell you that she looks much happier and more relaxed with her girlfriend Alicia. Although Kristen Stewart has never really spoken out about her live-in girlfriend Cargile and discussed their relationship in depth, it’s obvious that she is head over heels in love with her future wife. Since Alicia and Kristen were reportedly dating over a year ago, the two women have moved in together, gotten matching tattoos, and amped up the PDA. But, if and when they do get married it will most likely be in a low-key and private ceremony. Kristen Stewart isn’t exactly the most open and public celebrity when it comes to her love life, or anything else for that matter, so no one is expecting an elaborate over-the-top wedding from the actress. What do you think of Alicia Cargile and Kristen’s trip to Coachella? Do you think the couples appears happier that Robert Pattinson and Kristen Stewart seemed when they attended the music festival? When do you think the couple will get married? Let us know what you think in the comments below! Kristen Stewart Took Alicia Cargile As Romantic Date To Riley Keough’s Wedding: KStew Finally Comes Out!